Protected Cage for Head Assembly - also provides access to quickly hand position the laser beam on a known point or work area. Full Selection of Beam Visibility Enhancements - such as variable speed selection, variable scan angles for maximum visibility in all light conditions. Fast Horizontal and Vertical Electronic Self-Leveling. 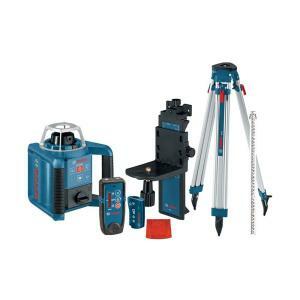 Tbook.com crawls the web to find the best prices and availability on Levels and related Tools and Hardware products like Bosch 1000 ft. Self-Leveling Rotary Laser Level with Layout Beam Complete Kit (7-Piece). For this page, related items include products we find that match the following keywords: "Level" at our vendor partner Home Depot. Bosch 1000 ft. Self-Leveling Rotary Laser Level with Layout Beam Complete Kit (7-Piece) is one of 154 Levels and related products listed in the Tools and Hardware section of Tbook.com If you have any questions on this product, please give us a call at 734-971-1210 during the hours of 9am - 5pm EST for assistance. Thank you for shopping at Tbook.com, the Internet Department Store!